On your way of becoming an Android developer, you most certainly want to thoroughly understand binding of data to a ListView using an Adapter, simply because you will be using AdapterViews in virtually every app you will develop from now on. In this post we will help you to get started. We’ll focus on the presentation of your data in Views. Data retrieval from content providers and databases are beyond the scope of this post. 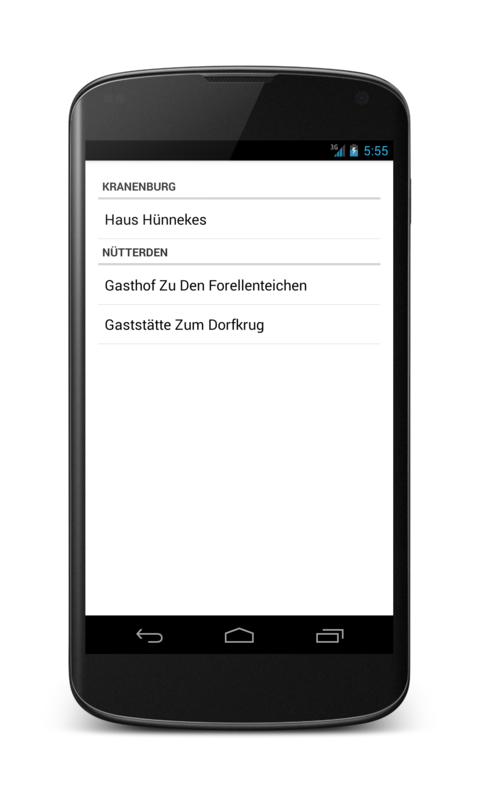 Suppose you’re writing a tourist app for the small German town of Kranenburg in the Reichswald region. Since we love excellent German beers and we might even be craving some solid German food after our outdoor activities, we would like the present the users a list of places where to find those. Next we need to wire up the views of our activity to display the data set. We’ll use an Adapter to bind the data to our views. Android’s built-in ArrayAdapter is suitable in this case. The ListView needs to know what to show at a given position and the Adapter tells it just that. It does so in two steps. For a given position it 1) inflates the appropriate view and 2) populates the view with data. So here’s the code for our activity. We retrieve the ListView from our main layout, define an Adapter by telling it which item view to inflate and which data to bind and then set the Adapter to our ListView. Note that the adapter will identify the TextView within our simple_pub_list_item. Note that we have to declare pubArray final in order to refer it like this from an inner class. There is no need to use an immutable array as the model behind your view. For instance, you can use ArrayAdapter to bind an ArrayList of Strings, so you can benefit from the power of the Java Collections Framework. Note that you cannot use this method on adapters that are designed for immutable data, like SimpleAdapter. No error will be returned, but the result won’t be as expected. You can however use it on ArrayAdapter as long as the adapter doesn’t lose reference to the bound dataset. Whereas we need the id and locality members in our app logic, we here want to demonstrate how to display the name members in a list. We need to store our data in a List of HashMaps. SimpleAdapter takes an array of hash keys (from) and an array containing the resource ids of our list item TextViews (to). The other approach would be to create our own adapter. As stated the above, the adapter inflates and populates the view for a given list item position. 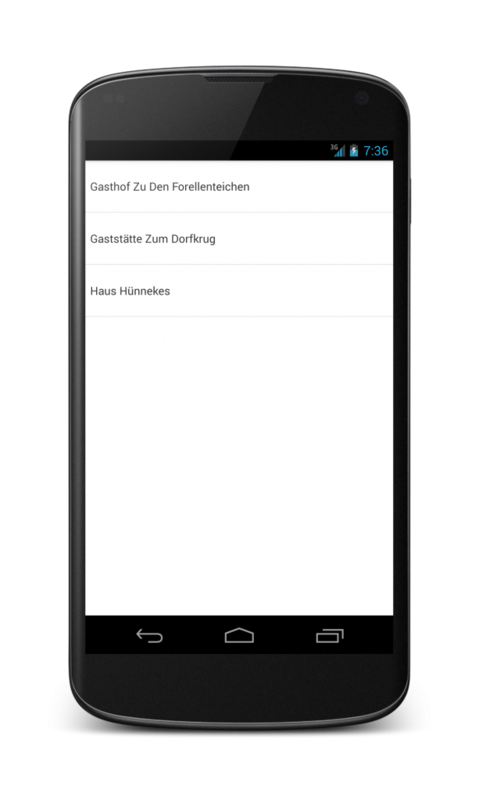 To that end the ListView calls the adapter’s getView() method. So we’ll have to extend an Adapter class (like BaseAdapter or ArrayAdapter) and override that method to suit our needs. View inflation is expensive. Therefore, ListView is able to recycle views that are not currently on display. Use convertView in the getView() method to retrieve this views if they exist. Note that you still have to populate them with data. Adding a default icon to the item view is as easy as incorporating an ImageView in the XML layout. Let’s add some pointless icons to our list. Now that we have set a default icon we can dynamically change it in the getView() method. Since we want to separate the data items by locality, we first sort the collection by this field. Then we loop through the collection and add a section to our main adapter when the locality changes. Furthermore, we keep track of the positions of clickable items in a HashMap that we can use in OnItemClickListener. It’s rather complicated, but there we have it: a clickable sectioned ListView.